Turn to the heart, our deepest root and foundation, our core. Today we contemplate the Good Shepherd's Heart and ours. The Good Shepherd's heart not only shows us mercy, but is mercy. There the Father’s love shines, I know I'm welcomed, understood, chosen, and loved. I renew the memory of when the Lord touched me and called me to follow him, the memory of the joy of having cast the nets of our life upon the sea of his word. The Good Shepherd's heart tells us his love is limitless and never gives up. We see his boundless self-giving, find the source of that faithful love that frees people, and rediscover Jesus loves us to the end. His heart reaches out to us, above all to the most distant. There his compass points, where we see a “weakness” of his love that desires to embrace all and lose none. Where's my heart directed? Our ministry is often full of plans, projects, and activities, but we must still ask, what's my heart set on, what's the treasure it seeks? “Where your treasure is, there will your heart be.” The riches of Jesus' Heart are the Father and ourselves. His days were divided between prayer to the Father and encountering people. So too our heart knows only two directions: the Lord and his people. The priest's heart is pierced by the Lord's love and so no longer looks to himself but is turned towards God and others. It's no longer “fluttering,” allured by whims, shunning disagreements, and seeking petty satisfactions; rather, it's rooted in the Lord, warmed by the Spirit, open and available to others. Seek out: God searches for the lost sheep, without fear of the risks. He leaves the pasture and his regular workday. He doesn't put off the search or think, “I've done enough today; I’ll worry tomorrow”; his heart is anxious till he finds the lost sheep, then, forgetting his weariness, he puts it on his shoulders, content. The heart that seeks out doesn't set aside private times and spaces; it isn't jealous of its quiet time and doesn't demand to be left alone. A shepherd after God's heart doesn't protect his comfort zone or good name; he''ll take risks to imitate his Lord. A shepherd after God's heart is free to set his concerns aside or calculate his gains or how long he's worked: he's not a spiritual accountant but a Good Samaritan who seeks out those in need and gives all he has. In seeking, he finds, and he finds because he takes risks. He doesn't stop when disappointed or yield to weariness but is stubborn in doing good. He keeps his doors open and seeks out those who don't want to enter. He constantly goes out of himself; the epicenter of his heart is outside himself. He's drawn by God and others, not himself. Include: Christ loves, knows, and gives his life for his sheep. No one is a stranger to him. His flock is his family and his life. 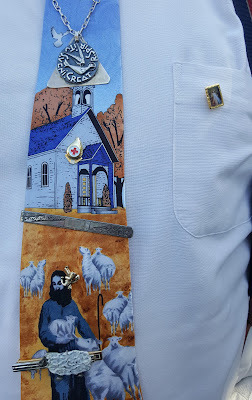 He's not a boss to feared but a shepherd who walks alongside them and calls them. He wants to gather the sheep not yet of his fold. We're anointed for his people, not to choose our own projects but to be close to the people God has entrusted to us. No one is excluded from our prayers or smile. With a father’s gaze and heart, we welcomes everyone, and if we correct, it's to draw people closer. We're ready to dirty our hands. We don't await compliments, but reach out, rejecting gossip, judgments, and malice. We listen to people and accompany them, sowing forgiveness with compassion. We're ready to bring people back and resolve disagreements. Ez 34:11-16 I will look after my sheep as a shepherd tends his flock. I'll rescue them, lead them out, gather them, bring them back, and pasture them. They shall lie down on good grazing ground and be pastured in rich pastures. I will give them rest, says the Lord. I'll seek out the lost, bring back the strayed, bind up the injured, and heal the sick, but I'll destroy the sleek and strong. Ps 23:1-6 "The Lord is my shepherd; there is nothing I shall want." He gives me rest, leads me, refreshes me, and guides me. I fear no evil; for you're at my side to give me courage. You spread the table before me and anoint my head with oil. Goodness and kindness follow me, and I'll dwell in your house. Rom 5:5b-11 God's love has been poured into us through the Holy Spirit. God proves his love in that while we were still sinners, Christ died for us. Since we're justified by his blood, we'll be saved through him. We boast of God through our Lord Jesus Christ, through whom we've received reconciliation. Lk 15:3-7 "Who among you losing one of your 100 sheep wouldn't leave the others and go after the lost one, then rejoice with your friends when you find it? There will be more joy in heaven over one sinner who repents than over 99 who have no need of repentance." Creighton: Today's feast is about the sacredness of Jesus' loving heart; he with the fidelity and dedication of a self-sacrificing shepherd. It can be a challenge to let Jesus love us. We can resist experiencing, receiving, and enjoying love. But Jesus loves us unconditionally; the more we need his love and comfort, the more he loves us. His love is tender, patient, understanding, forgiving, encouraging, supportive, comforting, faithful, and accompanying. He likes and enjoys us and wants to be with and share with us. "O, Lord, our God, you made us for yourself and our hearts are restless until they rest in you" (Augustine). We recognize when we're restless, unsettled, or craving stuff we think will make us happy or relieve emptiness. Jesus promises to make his home in us and to let us make our home in him. When we come home to that love, we are really happy. Jesus, show me your love; let me enjoy it and be filled with and freed by it. May my heart be like yours, beating with yours, on fire like yours, fearless.... Let me share your love. Let me dedicate my life to being tender and forgiving, to accompanying and comforting, to bringing justice and unity. One Bread, One Body: "Loved one": We want to be loved, but we don't necessarily value being loved by Someone who loves everyone. We want to be loved exclusively; you may not be impressed with someone who says "I love you" to everyone. But God loves everyone individually and specially; God's individualized knowledge of each of us indicates his individualized love for each of us. He'd leave 99 in the desert to focus his attention on you. He doesn't love you because he loves everyone; rather, he loves everyone, because he loves each individually and specially. Passionist: God wants us to know him and walk with him and live and move and have our being in him. He is a personal God, not far off and unreachable. May we help the lost find their way back to God's love.